At the end of last year, my husband and came up with a little creative endeavour for the both of us to work on (a small app). While I worked on fleshing out the characters at the beginning of 2017, we started to see a bigger potential for it and being the crazy creatives we are, imagined all kinds of things it could transition into. Based on the characters' expressions, we started to see their personalities emerge and my husband ended up coming up with the characters' names, backgrounds and motivations with the possibility of later creating a story with them in it. Although I have illustrated stories for others, neither of us had had much experience writing our own but we thought it would be a good opportunity to put some of the things we've learned over the past few years to use. I had managed to get most of the characters cleaned up and in various poses when paying client gigs came in and we had to put it and other personal projects on hold. My husband is a web developer which tends to be all-encompassing and, when I get deadlines, I tend to brush everything else off to focus on that. Because work kept coming in, the project had to sit on the back-burner. Client work came from a variety of industries which pushed me to learn new things quickly to be able to meet my deadlines. I had a lot of new experiences: I ended up pencilling and inking a comic cover to be coloured by another artist; I did my first-ever full-colour comic work, from pencils to colours and lettering; I designed a banner to promote a book I worked on, and a YouTube still for a musician I know; I collaborated with an art director from an ad agency on a few projects including spot illustrations, package label, and logo. It felt a little surreal getting all these requests because, due to lack of time, I had distanced myself from social media. I'm still not sure which was the cause and which was the effect! One of the projects I collaborated on with an art director went through a number of iterations before a final image was chosen. It started off as a relatively simple cartoon likeness of the client but they ended up wanting to push it further into the realm of caricature. 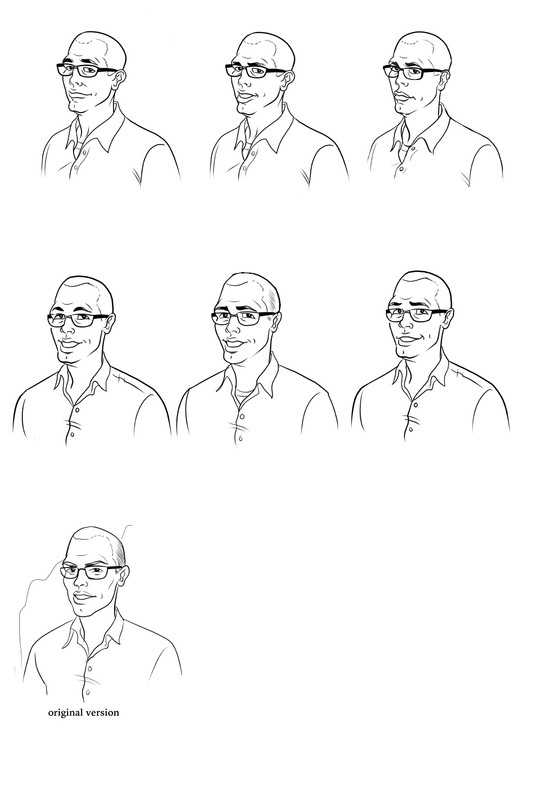 Unfortunately, I can't show the final image but you can see some of the iterations. 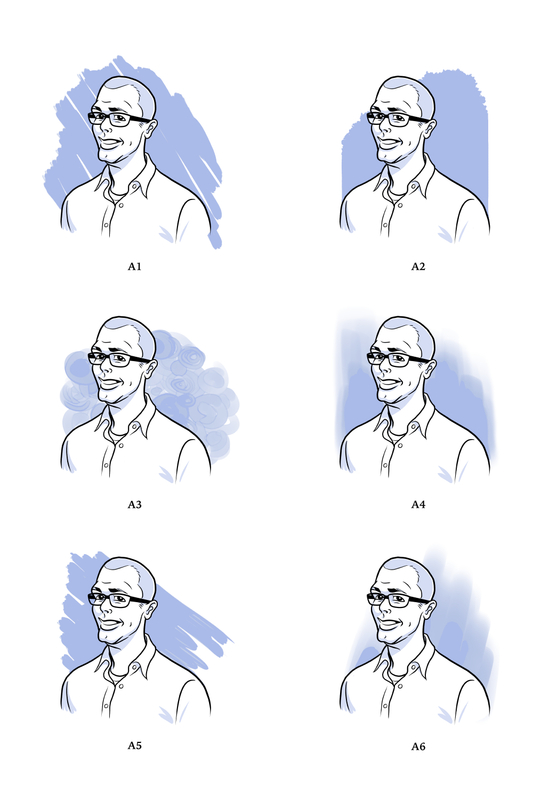 This process opened my eyes to the nuances of what art directors and clients might ask for. Even with client work, I made a point of trying to keep up with my online Schoolism classes, albeit at a slower pace. I learned a lot of useful tips that I plan to apply to the latter half of our project. While I didn't have much time to do the homework, I did watch and absorb a few online courses. I love how it gives me a new perspective about art and the many ways to approach it. Hearing other artists share their experiences, backgrounds and tips, has made me feel less stressed about my own art and more excited about the future and possibilities. This was a huge revelation for me because I've always been a little too critical about my work which sometimes tends to hold me back. I'm learning that everyone has their own creative process and style so I need to not be so hard on myself. I learned a great many things that contributed to my feeling much happier in 2017. I learned that it's not necessary to compare myself with others but to embrace the things I do well as an artist. That doesn't mean I will stop trying to push myself or evolving. I learned that limiting my exposure to social media made me less stressed and distracted. I learned not to worry too much about what others think and to instead focus on my work and projects; there will always be people that like what you do. I also learned a little about legal contracts and picked up copies of Graphic Artists Guild Handbook: Pricing and Ethical Guidelines and Business and Legal Forms for Illustrators. Thanks for all the support and here's to a healthy and prosperous 2018 to you all!